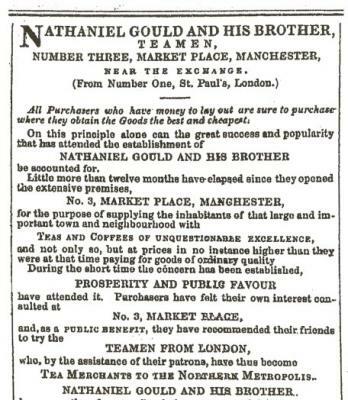 An advertisement for his business, Nathaniel Gould and His Brother, Teamen from London, appeared on the front page of the Manchester Times on 7 July 1849. It was a large and detailed spread on the front page, and must have been costly. It seems to have been the first advertisement of the Manchester business, and clearly proved very successful for the brothers. In the advertisement they thanked their customers and offered their wares. Finest teas at no higher prices than those demanded elsewhere for less superior goods. Assam, Orange Pekoe, Souchong and Scented Caper jostled among Hyson, True and Imperial Gunpowder, and Good Twankey. Coffee from Java, Ceylon, Jamaica and Costa Rica yielded pride of place alongside Mocha to aged Mountain Coffee that had become “like good old port wine, mellow in ripeness and richness of flavour” at two shillings per pound. And all roasted in silver cylinders and packed in sealed magnum bottles, for which no extra charge was made. Cocoa and chocolate was offered in extensive variety – Spanish, Best Plain, Sir Hans Sloane’s, Churchmans, Best Broma, Genuine Trinidad, as nibs, nuts, paste, powder, soluble or loose. Spices were of the finest quality: Bencoolen and Amboyna cloves, bright mace, cinnamon, cassia, nutmegs, cayenne peppers (long, white, or black), pimento, English mustard packed in tin foil (“pure as it is grown, very superior”), ginger from Jamaica, East India or the Barbadoes. And among the “etceteras” were included Patna, Carolina and ground rice, caraways, Italian macaroni and vermicelli, pearl sago, Valencia and Jordan almonds, candies orange and lemon peels, Bermuda and Jamaican arrowroot, finest tapioca, and picked or unbleached isinglass. The advertisement must have been costly, but it proved to be well worthwhile (1). The business continued to expand, both within and outside Manchester. In 1853 Nathaniel Gould and His Brother notified “their Friends and Customers in Derbyshire and Staffordshire” not only that they had received the new season’s provisions but also that they had appointed as their local agent Mr H.D. Parker of St John’s Street in Ashbourne (2). “Nathaniel Gould and His Brother” were not the only tea merchants in Manchester, but so famous did the firm become that they were lampooned in the Christmas pantomimes as “Nathaniel Gould and his mother from London” (3). (1) Manchester Times 7 July 1849. (2) Derby Mercury 23 November 1853, 7 and 28 December 1853 and 18 January 1854. (3) The Magic of Sport page 10.